Axel Schultze Co-Founder and Chairman, World Innovations Forum, overseeing the fulfillment of the World Innovations Forum’s purpose. Before the World Innovations Forum, he was co-founder of the Society3 Group (San Francisco Accelerator) and before that he was founder and CEO of Silicon Valley based BlueRoads, the most successful Channel Management software as a service, founder and CEO of Infinigate, one of the largest Internet Security provider in Europe, (today a quarter Billion in revenue) and founder and CEO of Computer 2000, the most successful European computer distributor, which grew to $5 Billion in revenue and merged with TechData. Marita Schultze Co-founder and Chairwoman, World Innovations Forum, building the global partner network and programs. Before World Innovations Forum, she was co-founder of the Society3 Group (San Francisco Accelerator) and before that cofounder of Silicon Valley based BlueRoads, co-founder and investor relations manager at Infinigate AG. Her career included capital raising for a hotel project as well as various sales, marketing and operations roles in the Hotel, Travel & Tourism industry in Europe. Rob Stevenson Analyst, Technology Backend and community support. Rob joined the team from Society3 where he was responsible for product engineering and support. 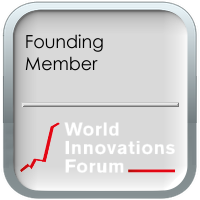 Manuela Rantra is a founding member of the World Innovations Forum. Before that she was managing director, at Society3 Group, organizing the business structure and managing the Society3 Accelerator (San Francisco Accelerator) .